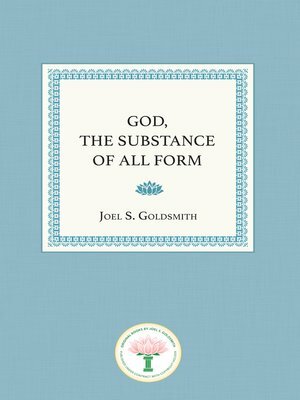 In God, the Substance of All Form, Goldsmith establishes the mystical truth that God is the reality, the divine consciousness of our being, and that the purpose of the spiritual life is to bring us to the fullness of that realization. He teaches that we can come to this realization through meditation, in which we can gain a conscious awareness of the presence and power of God as individual consciousness. In other words, the object of a spiritual path is to experience the truth that "I and my Father are one." "We have said that God is the substance of all form, that God is the reality of all form, the substance and reality of all effect. Are we then to understand God as the substance of the body, trees, flowers, sun, moon, stars, and all that we cognize with the material senses? No, this is a spiritual universe. It is true that God is the substance of all form: God is the substance of your very body and of all creation; but remember, when I see you, that is, when I see your body or when I see the trees or flowers, I am not seeing God's creation – I am not seeing the spiritual universe – I am seeing only a finite material concept of it. This concept is what Jesus referred to when he said, 'My kingdom is not of this world.' This does not mean that there are two universes, the real and the unreal, or that there is a real body and an unreal one. It means that the only universe there is, is the real universe, and the only body there is, is the real body, but what I am seeing is my concept of them. Therefore, the only unreality about them is in my false concept of them." With the finely honed skill of a master teacher, Goldsmith elaborates on this challenging principle, using it to explain how spiritual healing work is done, and emphasizing that a healing consciousness is one that is consciously aware of the perfection that already exists, despite any appearance. Reiterating the principle that there is only one Consciousness and that we are that Consciousness individualized, he answers age-old questions about death, the nature of the material world, and the relationship between consciousness and experience. He reveals how our conscious awareness of these truths can ensure a life of harmony, peace, abundance, and wholeness. Goldsmith says that the perfect spiritual universe is right here and now, and that to recognize it, we need only drop the "false sense" of humanhood. Then, once we have attained the consciousness and realization of the truth of our identity, we need "take no thought" for things. We can relax and rely on God, individual consciousness, the substance of all form.